Space Systems/Loral (SS/L) is building MTSat (Multifunctional Transport Satellite), an advanced geostationary satellite for air traffic control and weather observation, under a contract with the Japanese Ministry of Transport Civil Aviation Bureau & Meteorological Agency. This multi-functional satellite will provide communications and navigational services for aircraft, and provide weather data to users throughout the entire Asia-Pacific region, as far south as Australia / New Zealand. The spacecraft was delivered to Japan in March, 1999, for launch the next year on a Japanese H-II rocket. SS/L will conduct orbit raising and orbital tests before turning the satellite over to the ministry. All integration and ground testing of the satellite was conducted at SS/L's facilities in Palo Alto, California. It was launched on an H-2S rocket, but due to a rocket failure never reached orbit. MTSat 1 was to be renamed Mirai after reaching orbit, but this name was not used due to the launch failure. A repacement MTSat 1R is built also by SS/L. The Japanese Civil Aviation Bureau will use MTSat to reduce en route aircraft separation, provide flexible flight profile planning, enhance air travel safety, and improve the quality of aeronautical communications. To that end, it will be positioned at an orbital slot of approximately 140 degrees east, and provide high quality digital voice and data communications in the L, Ku, and Ka bands. The Japanese Meteorological Agency will use MTSat to provide observed cloud imagery and continuous weather products such as cloud and vapor distributions, cloud motion wind vector, sea surface temperature, and information on typhoon, low pressure, and front activity. MTSat also will receive raw data from data collection platforms on land and sea, deliver it to a processing station, and then broadcast the processed data and imagery across the region. It is the successor to the GMS 1-5 satellite series. 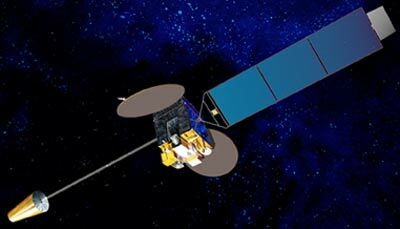 MTSat is based on SS/L's standard SSL-1300 three-axis, body stabilized spacecraft. It will use many of the state-of-the-art technologies developed for the current five satellite U.S. Geostationary Environmental Satellite program, called GOES I - M, for which SS/L is the prime contractor. MTSat will provide 10 years of service in its aeronautical mission and five years in its meteorological mission. MTSAAT 1R was retired in 2015 and was moved into a graveyard orbit above the geostationary belt.